Quarter each egg, place in refrigerator until ready for service. If greens are not prewashed, wash and thoroughly drain them. Combine all greens. Fill 9 x 5 salad tray with 2 cups of mixed greens. 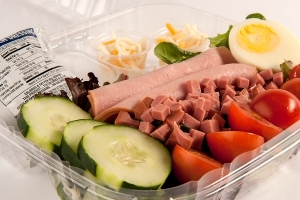 Other meats (such as ham, chicken, and turkey) may be used in place of turkey-ham. Use the Food Buying Guide for School Meal Programs if additional ingredients are used. Nutrient analysis must be re-calculated for alternate Chef Salad recipes. 1 serving of a Chef Salad.